Boo! Sales weren’t as spooky as we thought they might be. October brought some interesting treats. 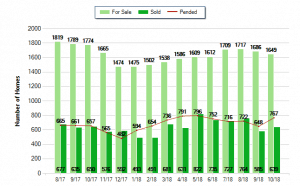 Here is your Bakersfield CA Real Estate Market Report – October 2018. Most years we see a dip in sales as we start our seasonal slowdown into the winter. However, this like last year actually had an increase in sales. October 2018’s sales were up 39 from September 2018’s homes sold number of 585. Likewise, we also saw an uptick in October’s properties going under contract number of 767 from Augusts number of 648. What’s interesting to note is that the inventory of homes decreased slightly from 1,686 in September to 1,649 in October. The average price per square foot remained flat from September 2018 to October 2018 at $142. Interesting to note is that the average days on market did decrease from 39 in September to 38 in October. The average price for homes listed for sale dipped slightly from $292k in September to $287k in October. Similarly, sale prices also saw a dip from $255k to $250k. Now this is definitely an interesting turn of events. Buyers and Sellers should be aware and prepared for the next couple months to really gain an accurate trend. Since September 2018 was a Neutral Market and October is back to being a Sellers Market we may now have the momentum to carry us through the slow season. Be vigilant with this information though as we might only be seeing the transition from Neutral Market back to Sellers Market due to Sellers not listing their homes on the market for the holidays. If you’re thinking of buying or selling a home and would like more information regarding the local Bakersfield CA markets, check out our other market reports or to further discuss the Bakersfield CA Real Estate Market Report – October 2018 then please contact us. Or you can leave a comment below.